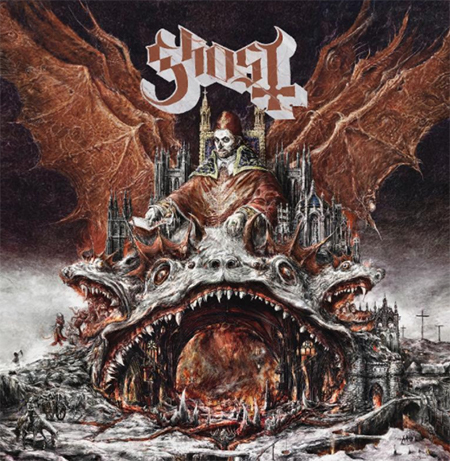 Ghost today announced their first-ever headline arena dates in support of their fourth sacred psalm Prequelle. Ghost will perform at The Forum in Los Angeles, CA on November 16, 2018, and Barclays Center in Brooklyn, NY on December 15, 2018. Tickets for both shows go on sale on this Friday, May 4th at 10:00am local time and will be available HERE. Ghost broke news of the arena performances this morning with a special press conference helmed by Papa Nihil and Sister Imperator at Irving Plaza in New York City. Watch their special sermon via the band’s Facebook HERE. The duo also debuted the Chapter Three: Back on the Road live at the event, finally putting to rest the age old question of where all the Papas go. Watch the band prepare for their upcoming tour dates in the clip HERE. Next week, Ghost will embark on a US tour that will kick off on May 5, 2018 in Riverside, CA, and visit US Cities throughout the Spring. Tickets for the Rats On The Road Tour are available now HERE. Pre-order their album Prequelle (pronounced prē-KWELL) now HERE and receive instant download of their single Rats. Limited edition bundles featuring deluxe, colored vinyl, 8-track cartridge, cassette tape, Rats die cut picturedisc, plague mask, musical eucharist case, pins, and more available exclusively in the Ghost Shop here HERE.